"American readers who'd like not to be caught off guard the next time the Nobel goes out to the German-speaking world ... may do well to acquaint themselves with the work of Durs Grünbein ..."
"... Grünbein's poems read as if the forces of history pressing in on the present drove them into this world." "Grünbein's ... work has a depth that deserves our attention." 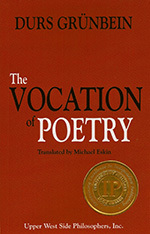 One of the world's greatest living poets and essayists, Dresden-born Durs Grünbein has had been the recipient of many national and international awards, including the Georg Büchner Prize (Germany’s most prestigious literary recognition) (1994), the Friedrich Nietzsche Prize (2004), the Friedrich Hölderlin Prize (2005), the Berlin Literature Prize (2006), the Premio Internazionale di Poesia Pier Paolo Pasolini (2006), and, together with Adam Sagajewski, the German-Polish Samuel Bogumil Linde Prize (2009). 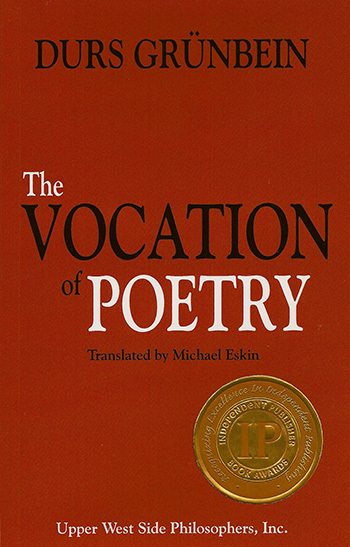 His book Ashes for Breakfast: Selected Poems (translated by Michael Hofmann) was shortlisted for the Griffin Poetry Prize 2006. He has also been a Fellow at the Villa Aurora in Los Angeles and the Villa Massimo in Rome, Italy. In 2009, he was awarded the Order Pour le Mérite for Sciences and Arts as well as the Great Cross of Merit with Star by the President of the Federal Republic of Germany. Since 1988, when the then twenty-five-year-old’s first collection of poems, Grauzone, morgens (Gray zone, morning), appeared — a mordantly poignant poetic reckoning with life in the former East Germany—Durs Grünbein has published more than twenty books of poetry and prose, which have been translated into dozens of languages. He holds the Chair for Poetics and Artistic Aesthetics at the School of the Arts in Düsseldorf, Germany, and lives in Berlin, Germany.